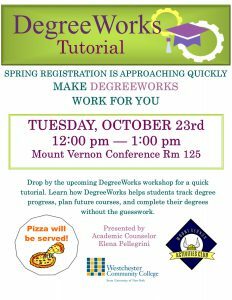 Spring registration is approaching quickly – Make DegreeWorks work for you! Drop by the upcoming DegreeWorks workshop for a quick tutorial. Learn how DegreeWorks helps students track degree progress, plan future courses, and complete their degrees without the guesswork. Presented by Professor Elena Pellegrini, Academic Counseling. Co-sponsored by the Mount Vernon Extension Center and the Mount Vernon Activities Club.